You'll be £19.99 closer to your next £10.00 credit when you purchase The Battle of Hastings 1066 - The Uncomfortable Truth. What's this? Order within the next 8 hours, 48 minutes to get your order processed the next working day! The Battle of Hastings is the most defining event in English history. As such, its every detail has been analysed by scholars and interpreted by historians. Yet one of the most fundamental aspect of the battle – the place upon which it was fought – has never been seriously questioned, until now. Could it really be the case that for almost 1,000 years everyone has been studying the wrong location? In this in-depth study, the authors examine the early sources and the modern interpretations to unravel the compulsive evidence that historians have chosen to ignore because it does not fit the traditional view of where the battle was fought. Most importantly, the authors investigate the terrain of the battlefield and the archaeological data to reveal exactly where history was made. The authors make a good historical argument, demonstrating that there is little early evidence to support the traditional battlefield. Clearly more archaeology is needed in the area, and hopefully the true site will eventually be found. In the meantime this is a good examination of the evidence against the current site (or the lack of evidence in its favour). The book bowls along and is a real page turner. The authors look in depth at the source material, and do this with a very critical eye. In conclusion, this is an in-depth study and, indeed, the authors have consulted many sources... As an academically-flavoured work, it is quite well written and remains remarkably accessible. The book remains excellent from an academic point of view...This book is a little gem for experienced readers. I have just finished reading John Grehan and Martin Mace’s The Battle of Hastings 1066. I was absolutely pleased to find that the views expressed in my book on Hastings published in 1998 had finally brought some reaction. The idea that the battle may have been fought on Caldbec Hill and not on the traditional Battle Hill site seemed to me quite a reasonable suggestion and one that had not clearly been put forward previously. I always realised that present use of the Abbey site for visitors, and its importance for the modern Battle, would act against locals being over-keen to accept the idea but was surprised that no one else, until now, had taken up the suggestion of an alternative site seriously. This new book is a careful investigation into the question of the location of the battle. In my book it was only part of the content since I was looking at the developments that led up to the battle as well as its history and consequences in general. This book looks at the site question in far more detail. It has an interesting review of previous historian’s comments. It looks carefully at the geography of the area. It examines the battle with detailed comment on how various manoeuvres and developments in the conflict could have occurred on possible sites. It seems to me to come to sensible conclusions. Sufficient evidence for such a distant event is always difficult to find in order to reach precise conclusions. In fact very few medieval battles can be exactly placed – and we know the recent change of view over the site of another of the best known medieval battles – Bosworth. I agree with the authors that, the evidence is not absolutely decisive but that the best present conclusion is that Caldbec Hill is more likely to be the battle site. Their discussion also looks at other placed mentioned in the evidence, such as Senlac and Malfosse, and again I largely agree with their conclusions here. I did notice the appearance of the word ‘Santlache’ (p.129 from Lemmon) which strikes me as the best bet of another mention of Senlac and might have been worth pursuing further. The very name Malfosse certainly would support the idea of it being a possible site for major burial. I liked the argument that the Abbey site might have been chosen as a defensive position against future troop movements inland and that William might have raised his standard there as a reason for using the site for building. Finally I find this an excellent book with good detail, careful examination of all sides of the question of the site, and well-argued conclusions. I just hope others will take notice this time. If only some archaeological work could settle the matter! I have just finished reading John Grehan and Martin Mace’s The Battle of Hastings 1066. I was absolutely pleased to find that the views expressed in my book on Hastings published in 1998 had finally brought some reaction. The idea that the battle may have been fought on Caldbec Hill and not on the traditional Battle Hill site seemed to me quite a reasonable suggestion and one that had not clearly been put forward previously. I always realised that present use of the Abbey site for visitors, and its importance for the modern Battle, would act against locals being over-keen to accept the idea, but was surprised that no one else, until now, had taken up the suggestion of an alternative site seriously. This new book is a careful investigation into the question of the location of the battle. In my book it was only part of the content since I was looking at the developments that led up to the battle as well as its history and consequences in general. This book looks at the site question in far more detail. It has an interesting review of previous historian’s comments. It looks carefully at the geography of the area. It examines the battle with detailed comment on how various manoeuvres and developments in the conflict could have occurred on possible sites. It seems to me to come to sensible conclusions. Sufficient evidence for such a distant event is always difficult to find in order to reach precise conclusions. In fact very few medieval battles can be exactly placed – and we know the recent change of view over the site of another of the best known medieval battles – Bosworth. I agree with the authors that the evidence is not absolutely decisive but that the best present conclusion is that Caldbec Hill is more likely to be the battle site. Their discussion also looks at other places mentioned in the evidence, such as Senlac and Malfosse, and again I largely agree with their conclusions here. I did notice the appearance of the word ‘Santlache’ (p.129 from Lemmon) which strikes me as the best bet of another mention of Senlac and might have been worth pursuing further. The very name Malfosse certainly would support the idea of it being a possible site for major burial. I liked the argument that the Abbey site might have been chosen as a defensive position against future troop movements inland and that William might have raised his standard there as a reason for using the site for building. The Mount Joy point is also interesting. I note that the name of Burne has been incorrectly printed twice as Bourne (p.127 and note 169). (Other minor printing errors noted: p.130 chose should be choose; p.142 Theses should be These). "Not only does it pose the challenging question where the Battle of Hastings was fought, it is also a gripping account of the run-up to and the battle itself and I did find it an enjoyable read. I love also the guide through the almost impenetrable who's' who of the claimants of the throne at that time." The Battle of Hastings 1066: The Uncomfortable Truth, claims the bloody clash between the Normans and the Saxons never took place on the battlefield at all, but just down the road on Caldbec Hill in Battle. John Grehan and Martin Mace spent two years researching and writing the book. 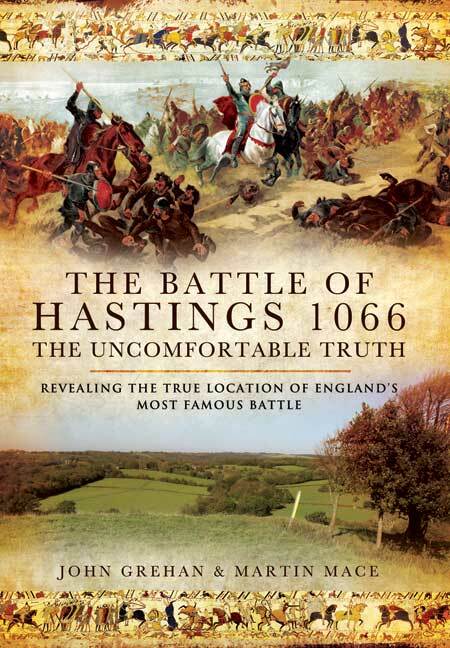 The Battle of Hastings 1066: The Uncomfortable Truth, is published by Pen and Sword Books.